2. pertaining to the pharyngeal tonsils or to hypertrophy of them. 4. (in the plural) hypertrophy of the pharyngeal tonsils, usually seen in children; adenoids may cause obstruction of the outlet from the nose so that the child breathes chiefly through the mouth, or the eustachian tube may be blocked, with pain in the ear or a sense of pressure resulting. It also may prepare the way for infections of the middle ear and occasionally interferes with hearing. Prolonged obstruction by enlarged adenoids produces a typical adenoid facies. The child appears to be dull and apathetic, and has some degree of nutritional deficiency and hearing loss, and some delay in growth and development. Surgical excision of the enlarged tissue is called adenoidectomy. (ad'ĕ-noyd), Avoid the misspelling/mispronunciation adnoid. 2. Epithelial and lymphatic unencapsulated structure located on the posterior wall of the nasopharynx. It undergoes absolute and relative enlargement during childhood and regresses during puberty. Inflammatory and physiologic enlargement is associated with otitis media, nasal obstruction, sinusitis, and obstructive sleep apnea. 2. pertaining to a pharyngeal tonsil. 4. (pl.) hypertrophy of the pharyngeal tonsils, usually seen in children. One of two masses of lymphoid tissue located at the back of the nose in the upper part of the throat that may obstruct normal breathing and make speech difficult when swollen. Of or relating to lymphatic glands or lymphoid tissue; lymphoid. 1 having a glandular, particularly lymphoid, appearance. (2) Relating to the adenoids. 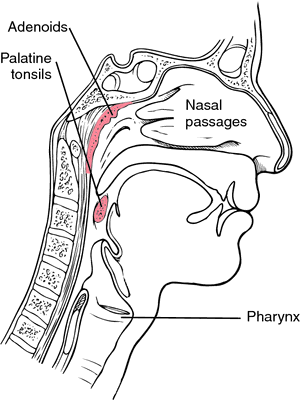 noun Nasopharyngeal tonsil, pharyngeal tonsil; a mass of lymphoid tissue located at the posterior aspect of the soft palate. 2. Relating to the adenoids noun See Adenoids. 1. Glandlike; of glandular appearance. Synonym(s): adeniform, lymphoid (2) . 2. One of the ADENOIDS. an enlarged mass of lymphoid tissue at the back of the pharynx, which may obstruct breathing. It occurs most commonly in children. A collection of lymph tissue located in the nasopharynx. (ad'ĕ-noyd) Avoid the misspelling/mispronunciation adnoid. 2. Epithelial and lymphatic unencapsulated structure located on the posterior wall of the nasopharynx; enlargement is associated with otitis media, nasal obstruction, sinusitis, and obstructive sleep apnea. Q. When should the tonsils and/or adenoids should be removed? A. Currently the tonsillectomy is recommended in the presence of 6 episodes of throat infection (Group A strep pharyngitis) in one year or 3-4 episodes in each of 2years. Adenoidectomy may be recommended when tympanostomy tube surgery (http://en.wikipedia.org/wiki/Tympanostomy_tube) failed to prevent ear infection. Another thing to consider is the presence of oral breathing - the constant use of the mouth for breathing in small children may lead to malformation of the facial bones that would necessitate more extensive surgeries later in life.